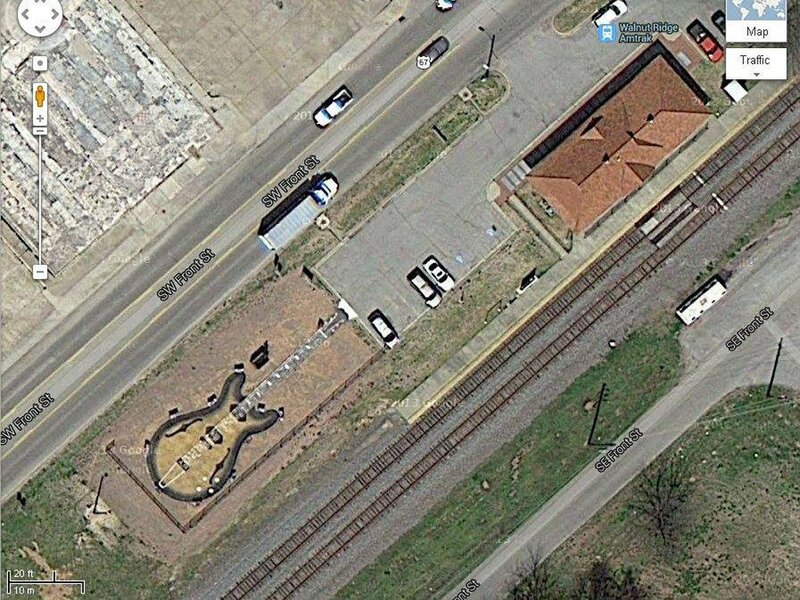 At 115 foot long by 40 feet wide, the Guitar Walk may break all the existing size records for an Epiphone Casino Guitar, and can be seen by satellite image. 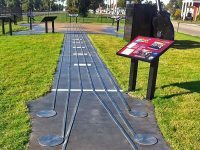 The Guitar Walk is a 115 foot long concrete guitar, complete with frets, strings and unbelievable detail. 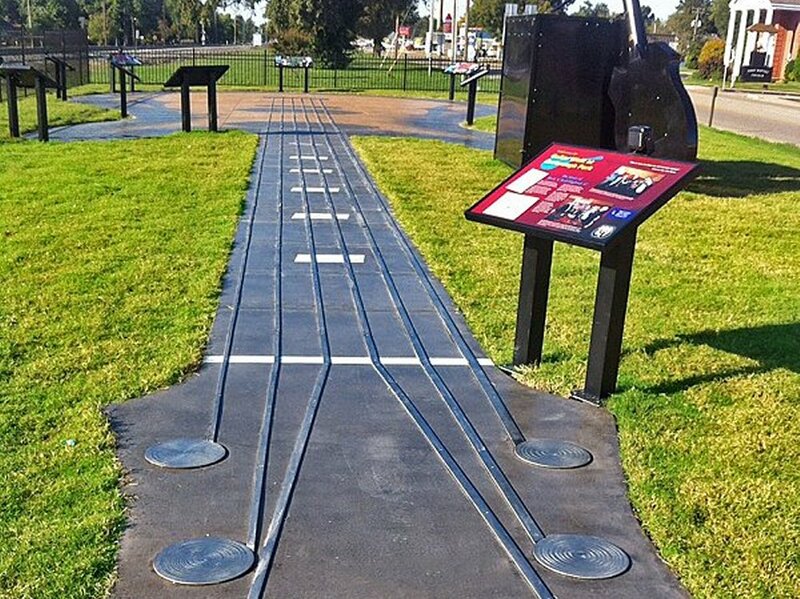 Along the edges are plaques that are nothing short of mini museums, paying tribute to the early legends that gave birth to Rock n’ Roll, at venues along Rock n’ Roll Highway 67 that runs through the area. 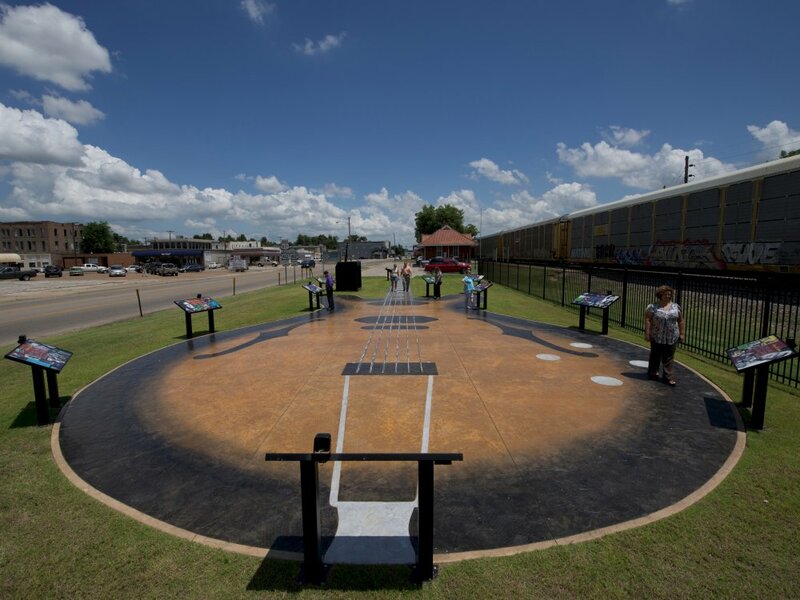 The free walk includes audio narration by none other than legendary Sun Studio recording artist, Sonny Burgess. 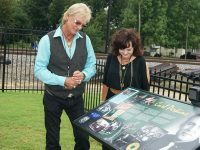 Elvis, Jerry Lee Lewis, Conway Twitty, Johnny Cash, Carl Perkins and others are honored on the Guitar Walk at Cavenaugh Park. 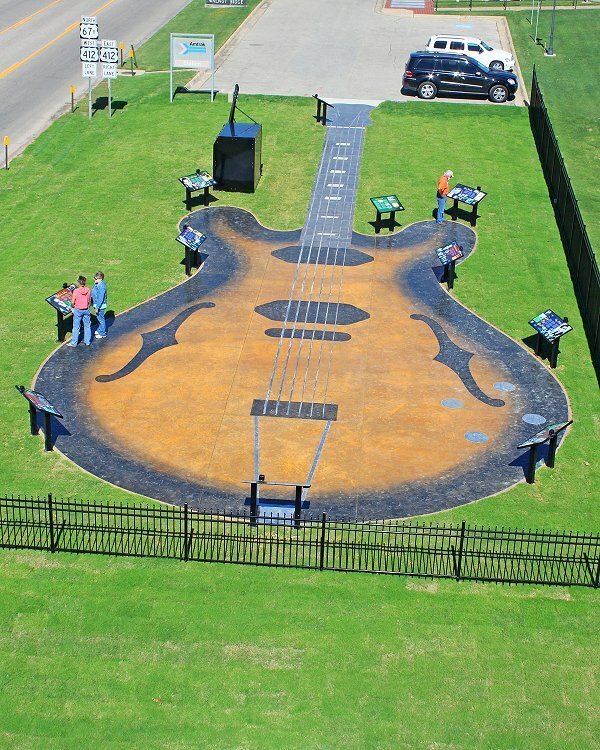 The Epiphone Casino wasn’t invented until the early 1960’s and was seldom, if ever, used by the early Rockabilly artists so why use the Casino as a tribute to those who helped develop rockabilly and birthed rock n’ roll? 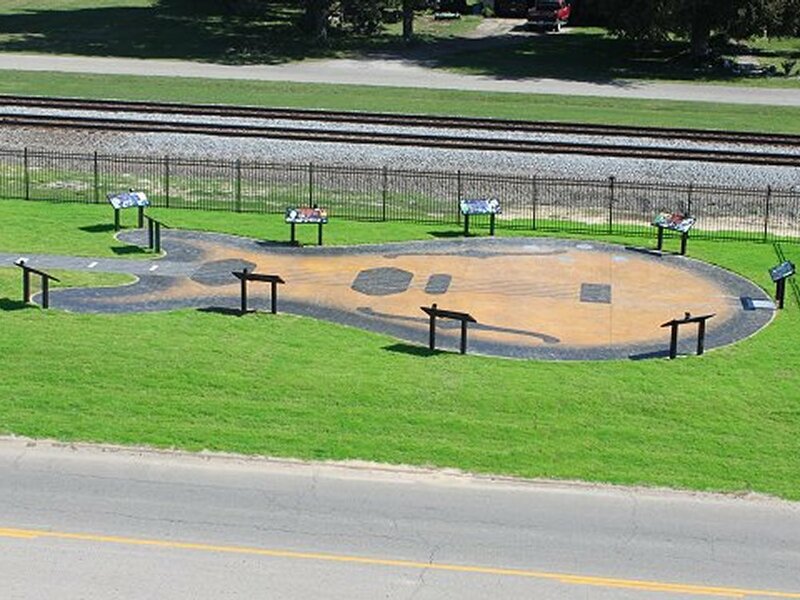 When the mountain music of the Ozarks met the sound of Delta Blues their marriage gave birth to a unique blend of music known as rockabilly. Many of the Sun Studio artists performed in gymnasiums and honkytonks along Rock n’ Roll Highway 67 as they honed their musical skills. At that same time rockabilly sounds were popular across the pond in cities like Liverpool. 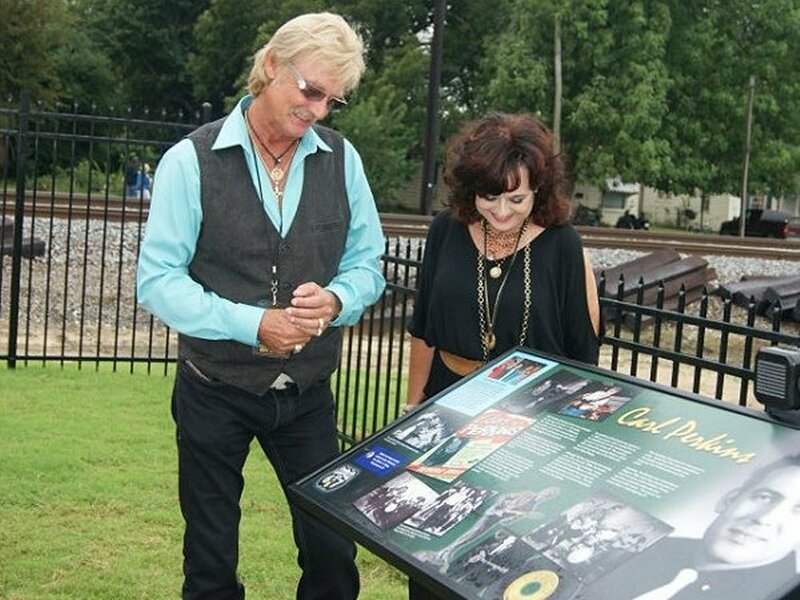 There is a strong connection tying The Beatles to many of the early rockabilly legends and the music they birthed. John Lennon once said “Nothing really affected me until I heard Elvis.” As the lads from Liverpool expanded the music that influenced them, Paul McCartney was first to play an Epiphone Casino. After hearing the guitars unique sound, John and George acquired a pair of Epiphone Casinos, with the sunburst pattern chosen for this tribute. 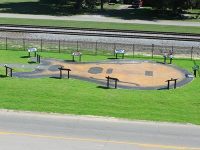 With a better understanding about early rock n’ roll and the musicians that birthed it, we hope you will find it fitting that we chose a guitar made famous by the world’s most popular rock band, The Beatles, to pay tribute to these and the other rockabilly legends who performed along Rock n’ Roll Highway 67.